Carousels bring the item / load to the operator, eliminating the walk and search time that frequently accounts for more than half of the picking / sortation time. White manufactures the broadest spectrum of horizontal carousels, in the industry, including the industry's only proven bottom driven designs for exceptional life and low maintenance. Where high pick rates are required, work stations, or pods can be designed for one operator to pick from two, three, or four carousels at once. This takes full advantage of parts commonality across the orders. This unique concept allows multiple orders to be processed at the same time. This will assure the operator never waits for the equipment. 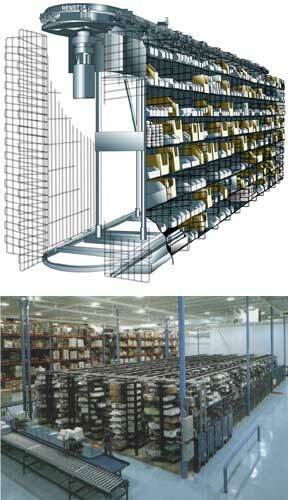 Multi-level systems with independently revolving carousels stacked on top of each other, can be picked independently to further maximize space utilization and speed up order processing.